With the Village Home Show launching this coming Sunday at on WQAD News 8 we wanted to give you a look around at the set itself. You may have already seen it in action during the morning news. Local chefs and guests have already began to use the fully-functioning new kitchen set on air. 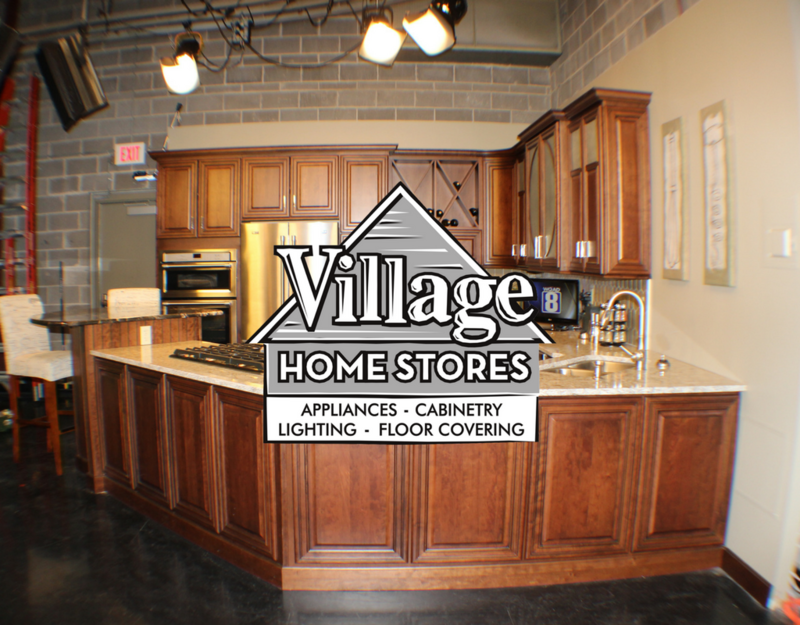 The Village Home Show will feature before and after stories of kitchen and bath remodel projects from right here in our area. We wanted to not overlook the before and after story of the set kitchen itself. This unused corner of the news studio at WQAD has been totally transformed into a kitchen larger than many we remodel. We made this space beautiful AND functional. The kitchen layout fits multiple users and is outfitted with camera-friendly finishes. There could be as many as three or four camera angles used during any taping and the space has to look as inviting as possible. The space within the kitchen is large enough for many users at a time to fit comfortably within while using it. We wanted to select finishes for this set that would look timeless and relate-able to viewers. We think these cherry cabinets and neutral finishes can be easily imagined in your own home. The main perimeter counter tops of the kitchen are by CambriaUSA Quartz in a color called “New Quay”. The kitchen cabinetry is from our Dura Supreme line and the Cherry Valencia door in a “Mission” stain and “Charcoal” glaze has been installed throughout the set. The pub-height table top is a granite perfectly named “Earth Glitter” The natural veining and shimmers add a bit of character to the space without looking busy or distracting from the guests who may be seated there. The backsplash tile we selected for the set kitchen has already become very popular. It is a ceramic tile from Walker Zanger’s 6th Avenue Collection. With bright studio lights and cameras pointing in many directions, we wanted a big impact but nothing reflective. This “Cocoon” shaped “Flax” tile is available in a matte finish. 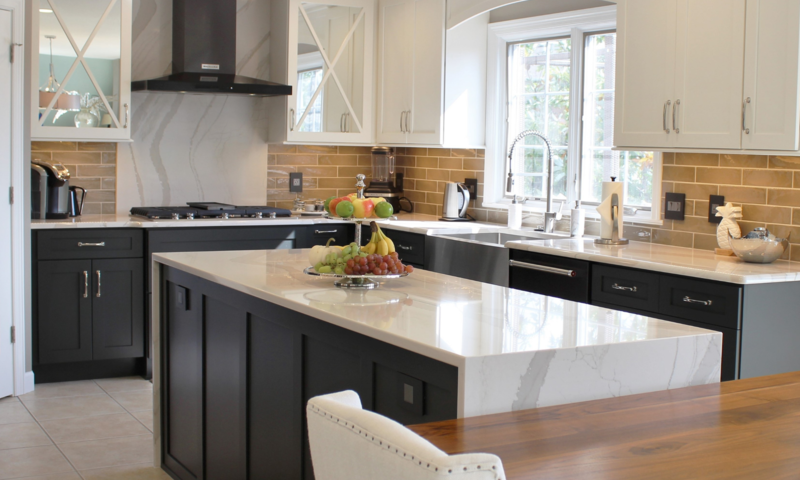 Quartz counters were chosen for their excellent durability for this multi-use space. When you see the kitchen on-air during cooking segments the user at the cooktop actually faces the news desk. The weather center is close by to the right of this peninsula. The weather team could take just a few small steps and sneak a sample of food being prepared a few feet away. The kitchen appliances you see in this set are all from the newest launch of Maytag products. Click on each link to see more about each model. A combination wall oven and microwave are installed right next to the large french-door counter depth refrigerator. Just in case the dishwasher needs to run while a camera is on, we installed Maytag’s quietest model available. The 5-burner gas cooktop will be getting the most use and that is why we designed the kitchen to keep that front and center. Curved doors on both the base and wall cabinets are a subtle detail that add a lot of style. This feature instantly created a custom-cabinet look to your space without having to shift all of your product over to a completely custom-cabinet line. The mullion door design options from Dura Supreme are very unique as well. We ended up selecting the look above to suggest the curves of an “8”. We have been thrilled to see the kitchen in use and are so excited to share the Village Home Show with you every Sunday. We love helping our customers create beautiful spaces in their homes where memories can be made and we look forward to watching a lot of great memories made at WQAD. We can’t wait to hear from you what you have seen happen in the new kitchen. Tune in every Sunday morning at 11am to learn about the latest industry trends, hear from expert guests and see beautiful spaces transform right before your eyes. 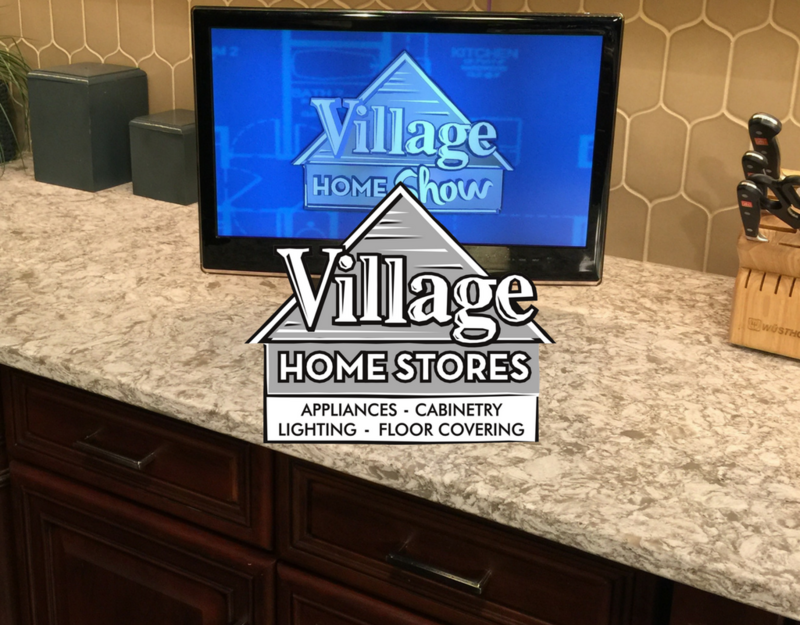 The projects featured on the Village Home Show are part of the Project Management program available from Village Home Stores. We can’t wait to share with you what we have been working on.